Fu Manchu, a crafty and clever orangutan in a Nebraska zoo, longed to roam outside the boundaries of the enclosure that he shared with four other orangutans. Although their outdoor play area allowed them to exercise and explore, Fu had his sights set on visiting a stand of elm trees growing near the elephant corral. One day, Fu secured a loose wire from a light fixture. He concealed it in his mouth until he found an opportunity to fiddle with the enclosure’s door lock. Wiggling and juggling the wire, Fu soon popped the lock, unbolted the door and signaled to the others that an unauthorized adventure was in store! ORANGUTAN HOUDINI, Neme’s debut picture book, is based on the true story of an adult male orangutan at the Henry Doorly Zoo in 1968. With gentle humor and mild suspense, Neme skillfully conveys the intelligence and capability of this mischievous ape with a penchant for escape. We, the readers, are in on the joke from the start, knowing how Fu was able to pick the lock. But poor Jerry Stones, the zookeeper, was repeatedly outsmarted by Fu and his friends, finding them at play in the elm trees on several occasions. The zookeeper warns his staff to be more careful with the locks. They double check the locks, and search the enclosure for possible lock-picking tools. Finally, they concede defeat and build a new enclosure for the orangutans. Fu then reveals the wire that he has kept carefully concealed in his mouth all along, and thus earns an honorary certificate from the American Association of Locksmiths. The attractive illustrations by Kathie Kelleher are colorful and nicely detailed, capturing the bemused and carefree attitude of the apes in contrast with the confused and frustrated zoo staff. Elephants, giraffes and a tiny chipmunk are also sprinkled periodically through the story, showing the disparity in the size of the zoo creatures and wildlife. ORANGUTAN HOUDINI will appeal to budding naturalists and those with an interest in animal intelligence. Neme includes a helpful author’s note that discusses the orangutans’ ability to make deliberate plans, devise tools, and deceive others in a playful fashion. The book is a great springboard to talk about ape intelligence and the careful design of stimulating and safe zoo habitats. And for those wanting even more information, Neme’s extensive website includes a wonderful teacher’s guide to accompany the book, as well as helpful information on orangutans, endangered species, and protection of international wildlife habitats. Where Obtained: I reviewed a copy of ORANGUTAN HOUDINI from my local library and received no compensation. The opinions expressed here are my own. 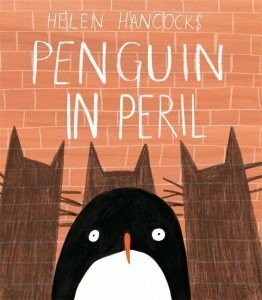 PENGUIN IN PERIL, written and illustrated by Helen Hancocks, is reviewed by MaryAnne Locher. Penguin in Peril written and illustrated by Helen Hancocks, Templar/Candlewick Press, 2014. What’s black and white and read all over? The front page of the Daily News when a penguin is stolen from the city zoo! Author-illustrator Helen Hancocks makes a big splash with her first children’s picture book, Penguin in Peril, (Templar/Candlewick Press, $15.99, Ages 3-7). Three hungry cats sit around their kitchen table and devise a plan for the greatest fish caper ever! All they needed was … a penguin. Hancocks could have used the stereotypical raccoon for her three masked thieves sneaking into the zoo and kidnapping the unsuspecting penguin, but she likes to draw cats, and cats in striped sweaters and masks are laugh-out-loud funny. Everything was going along swimmingly, except the cats didn’t speak penguin, the penguin felt he was in peril, and the cats discovered that a penguin is surprisingly good at hiding in plain sight as they chase him throughout the city. Habit-clad nuns and waiters in coats and tails make convenient camouflage for a penguin. Our little tuxedo-clad friend finds his way back to the zoo just in time for a fishy supper. The cats however don’t fare quite as well though they do manage to make the front page of the paper when they’re put behind bars! I loved the illustrations done in mixed media, the bright pops of red, green, and yellow, and the artful use of black and white, so necessary to the story. Hancocks’ use of background characters who are seen throughout the book is brilliant. She’s truly tapped into a child’s imagination with this story. What a wonderful debut! 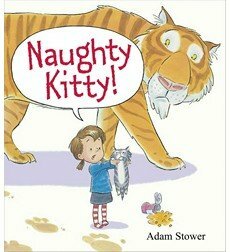 Naughty Kitty!, written and illustrated by Adam Stower (Orchard Books/Scholastic, $16.99, Ages 3-6), is reviewed by Ronna Mandel. Naughty Kitty! written and illustrated by Adam Stower, Orchard Books/Scholastic Press, 2014. Available at bookstores later this month, Adam Stower’s Naughty Kitty! is sure to be a story time treat! I can already hear the laughter of little ones as their parent or favorite librarian shares this delightful picture book from the author that brought us Silly Doggy! feline-oriented like this picture book. The hilarity of the artwork (see Kitty’s subtle facial expressions) coupled with the main character’s mistaken belief that her adorable and angelic pet is up to no good, make Naughty Kitty! one of this spring’s sweetest stories. When opening this picture book to the front matter, readers will learn from a newspaper cover illustration that a wild animal is on the loose. At the very same time young Lily is bringing home her precious new pet Kitty. I love how Stower positioned the escaped tiger behind the hedge with just enough stripe showing to keep us turning the page. What works so wonderfully is that, while unbeknownst to Lily, the reader realizes a wild tiger is about to enter the kitchen where she’s left little Kitty alone. The escapee proceeds to make a shambles of the kitchen, devouring everything in sight including “two teaspoons and a dirty sponge.” Thankfully though, the tiger has no appetite for Kitty! Lily scolds the innocent kitten and cautions him to leave the living room intact while she tidies up the mess. Can you guess what happens next? Yep, tiger who has been peeking through French doors, strikes again. This time enormous paw prints that have stained the den carpet hint at an intruder, but Lily still fails to notice the wild animal. It’s no surprise then that Lily, now quite “cross”, blames everything on Kitty. At this point Stower’s got youngsters pulling for poor, poor Kitty! The shenanigans continue outside as Lily reprimands her pet yet again and threatens to tell her mother. But here Stower has a surprise in store for readers that makes reading through to the back matter a must. So get the book, read it cover to cover and when your own friendly feline is itching for a tummy rub, indulge him!